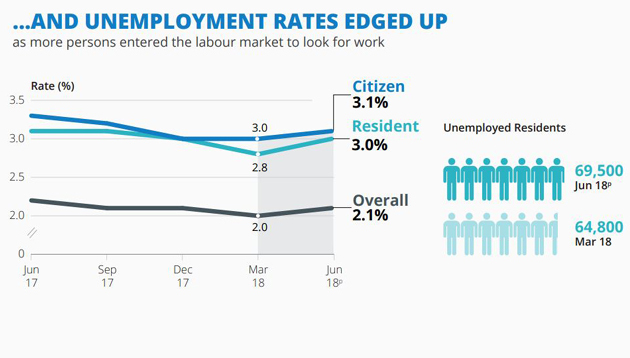 The Ministry of Manpower (MOM) has showed that the total employment in Singapore grew even as unemployment rates edged upwards in its latest Labour Market Report Advance Release Second Quarter 2018. According to the report, this occurred as more persons entered the labour force to look for work on the back of continued expansion in economic activities. Retrenchments in 2Q 2018 were lower than the same period a year ago, but higher than the previous quarter. Total employment (excluding foreign domestic workers) increased by 7,100 in 2Q 2018. 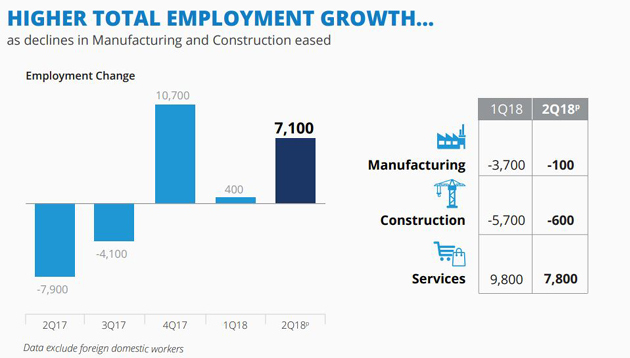 This was a larger increase than in 1Q 2018 (400), reflecting the moderated pace of contractions in construction and manufacturing employment. The increase in the second quarter of this year was also a reversal from the contraction observed in the same period a year ago (-7,900). The services sector continued to add workers, such as in transportation and storage, information and communications, community, social and personal services, professional services and financial and insurance. Additionally, the seasonally adjusted unemployment rates increased at the overall level (from 2.0% in March 2018 to 2.1% in June 2018), for residents (from 2.8% to 3.0%) and for citizens (from 3.0% to 3.1%) – following a general downtrend since June 2017. However, the rates in June 2018 remained lower than in June 2017. 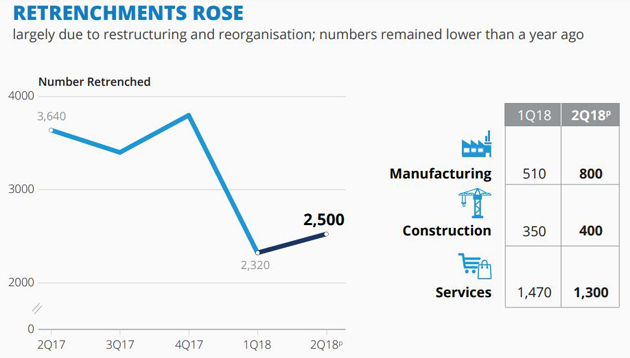 The number of retrenchments in 2Q 2018 (2,500) edged up from the preceding quarter (2,320), reflecting on-going restructuring and reorganisation. This occurred after a downtrend since the fourth quarter of 2016. In conclusion, MOM reported that the labour market continued to expand with net growth in total employment, while unemployment and retrenchments in 2Q 2018 remained lower compared to the same period a year ago. However, the unemployment rate increased compared to March 2018, which saw the lowest unemployment rate since March 2017. Retrenchments may also rise as restructuring and reorganisation gather pace. “MOM and Workforce Singapore remain focussed on helping job seekers secure better employment outcomes through the Adapt and Grow initiative, and businesses to transform and grow through the Lean Enterprise Development Scheme and the Capability Transfer Programme,” it concluded. The P&G CEO Challenge is a global competition designed to test students’ aptitude for business strategy and problem solving. ..